Lacquered Geek: Born Pretty Anniversary Sale! From October 17th through November 10th, BornPrettyStore.com is celebrating their 4 year anniversary with some great sales for their customers! From October 19 - October 22, they are having select items for only $0.01! There's a limited number of items, and each day there are new items. There is a limit of 1 item per account. You can see each day's special items here. I am in love with those poppy decals! 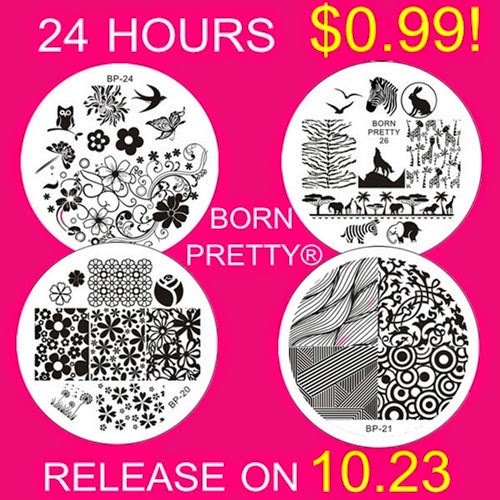 On October 23rd, the newest collection of Born Pretty Stamping plates launches, and they'll only be $0.99 for 24 hours! Check out the new plates here! From October 17 - October 31, there are going to be tons of discounts on a variety of items, some as low as $0.49! Finally, from November 3 - 7, you will be able to save at least 20% off their store. I recently placed an order from BornPrettyStore.com, and it looks like I'll be placing at least 1 more order during this great sale!